Beautiful Sugar Creek winds around the large screened porch of the Wildacre cabin, only yards away. 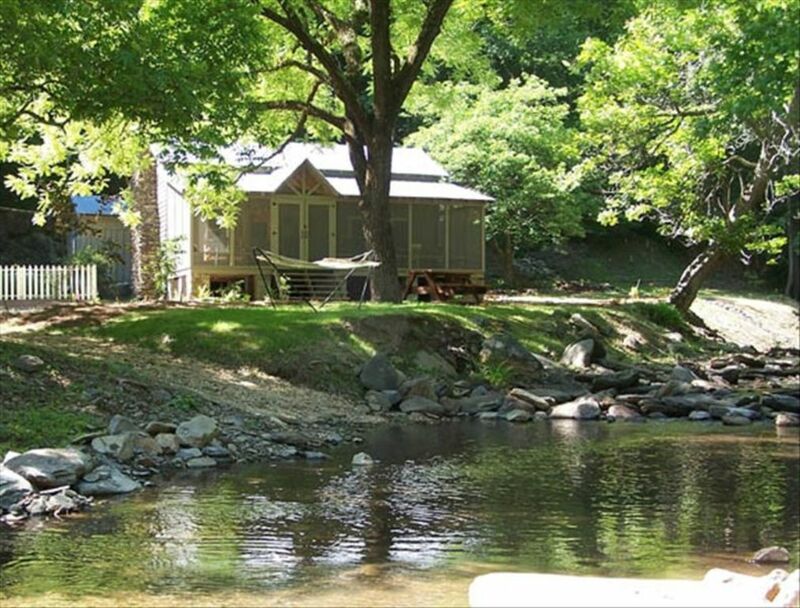 Sleep with your windows open and let the bubbling of the creek lull you to sleep at night. Enjoy a lazy afternoon in the hammock by the creek or relax in the rockers on the screened porch. Table and chairs available on screened porch for creekside dining in comfort. Picnic tables by the creek. Toast marshmallows in the campfire ring. Hike the trail on the property that crosses the creek several times, or hike on the Pin-Hoti Trail (joins the Appalachian Trail at Benton McKaye), only a mile away. Wildacre is located in the North Georgia mountains, off US 76/GA 282 between Ellijay and Chatsworth, GA. Near Fort Mountain State Park, Carters Lake, Chief Vann House, New Echota, outlet malls in Dalton, and antiquing in Ellijay. Cabin is located in a small valley surrounded by mountains. Large screened porch overlooks creek, only a few yards away. Bring your laptop & check your e-mail or surf the Net in the cabin, on the screened porch or from the hammock. A large library of 200 DVD movies is available, including a separate binder of children's movies. Campfire Ring, screened porch, lawn games such as badminton, volleyball and croquet. This was our fourth visit to this precious spot. Cabin is always very clean and well stocked with all needed items so packing is very simple since it is limited to clothes and food. The main feature that pulls me back every year is the sound of the water tumbling over rocks in the creek. Other than an occasional plane flying overhead there are no man made noises to hear. If you need peace and quiet and a place to linger over coffee you cannot beat Creekside cabins. Stay on screened porch, go hiking, explore area, go fishing at owners place close by. Secluded but minutes from a Dollar General for any forgotten items. Already looking forward to next visit!!! I would prefer it if no-one else knows about this cabin because I want it to be available for me anytime I am available for it, but that would not be fair to others. Truthfully, I can't imagine a better setting anywhere. The cabin is perfect, the setting is perfect, the privacy is perfect. Not too far from a small town, but very secluded and private. The hosts, Judy and Steve are awesome. They provide everything to make your stay enjoyable. Great communicators and super generous. I could go on and on, but I'd rather pack my bags and get back to this cabin. I recommend that you go find your own. One of a kind place! Truly a hidden gem! Rain on the tin roof, fire in the fireplace, the sound of the creek while sitting on the front screened porch enjoying a cup of coffee, no one around, can't think of a better place to unwind and detach from the hectic world. My wife and I stayed here this past weekend and loved it so much, we booked another stay for the fall while we were still there. Everything about our stay was excellent, and Judy made it that way, checking in with us and making sure we had everything we needed. Highly recommended for anyone who wants to unplug from the world, and truly enjoy the beauty's of nature. It was a wonderful anniversary getaway. We enjoyed it so much in both rain and shine. The cabin was clean, organized, well appointed, in a beautiful location with thoughtful touches to make sure our stay was perfect. This property was absolutely perfect for our family. It was clean, beautiful, far away from other properties, beautiful location, designed exactly like we would plan our own cabin if we built one! Everything we needed was there. We have stayed at other cabin properties before but this is our absolute favorite. First of all our host was great always a phone call away to help with anything. If you need to get away from your busy life this is the place. We enjoyed every part of it from sitting in the middle of the creek enjoying a glass of wine to hanging out in the hammock and listening to nature and inside the cabin was cozy, very clean with everything you need to feel at home. We will be back. Hiking trail on property, also near Pinhoti Trail, which joins the Appalachian Trail at Benton-McKaye, Fishing allowed in owner's lake,less than 2 miles away with restrictions. Children under 6 free. Two night minimum, three night minimum on holidays & holiday weekends. Taxes include 7% sales tax & 5% occupancy tax.